I took this photo of sunspots today with the kids I'm teaching in the Astronomy Summer camp at Warner Nature Center. You can see the umbra and penumbra of the larger spot on the right and the smaller spots would probably be called pores. You can see some lighter faculae to the left as well. 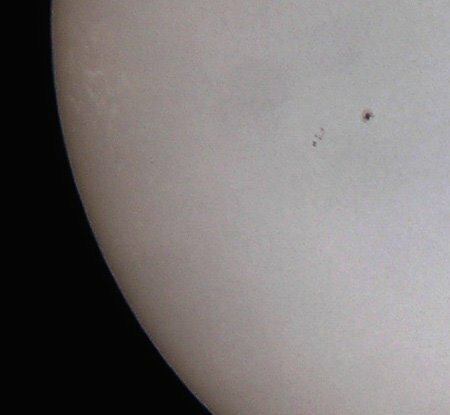 This was my first attempt at solar photography. I used a meade 8 inch SCT and a 40mm Tele-Vue plossol lens. The camera was a 3.2 megapixel Olympus C-740 and I used afocal projection. I held the camera with my hands as I don't have a special mount to hold it in place.